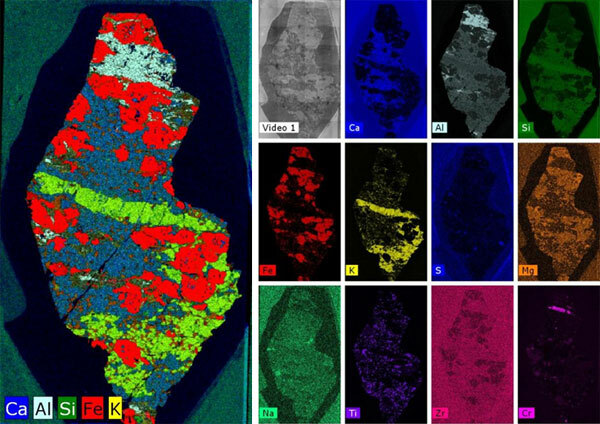 You can also determine which minerals, rather than simply which elements are present in a rock, with new software from Bruker. This can also be used with EDX, and data can be shared between the two platforms. Calculate the distribution of single elements. Display the sum spectrum of the complete mapping. Examine single point and accumulated spectra. Fast measurement – 0.3ms per pixel and up to 4 Million pixels in a single HyperMap. High spatial resolution – down to 25 µm X-ray spot size and motor steps of 4 µm. 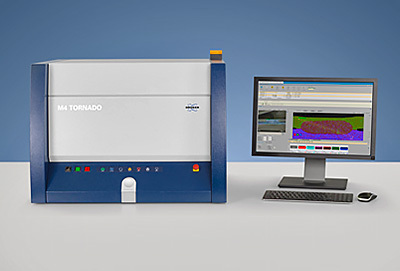 Fast, high resolution elemental distribution analysis with the M4 TORNADO. Powerful mineral identification and classification software: AMICS (Advanced Mineral Identification and Classification System). 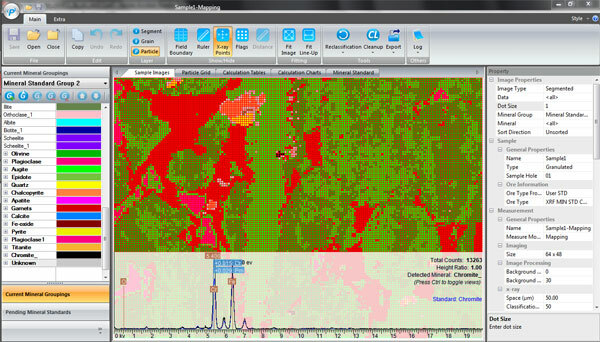 Analysing geological samples with AMICS: mineral class list, map, X-ray points and spectrum. Both thin sections and large geological samples, e.g. drill cores and hand samples can analysed easily down to micrometre scale. This has many useful applications in mining and geoscience, as well as minerals exploration and production, for micro-scale analysis of large samples and mineral phase results. 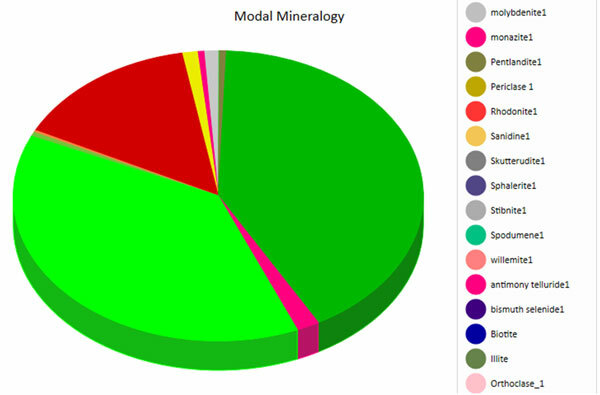 Determine modal mineralogy, mineral distribution and calculated assays. Analysing drill cores, thin sections, fossils and geologically interesting samples can be challenging, especially when studying the statistical and spatial distribution of minerals over large sample areas in the centimeter range. Micro-XRF is more cost-effective than alternative SEM-EDS analysers, which also involve extensive sample preparation procedures and carbon coating. It can take a day to measure areas of more than a couple of square centimetres. With micro-XRF, large samples can be analysed quickly; with little or no sample preparation, areas up to 190 x 160 mm can be analysed with high spatial resolution down to < 20 μm. Large data sets can be handled easily by the software. Sample files with over 500,000 pixels can be reprocessed in minutes, including images, spectra, mineral identification and classification data. Drill core analysed over an area of 11.05 x 117.85 mm² at a resolution of 50 μm per pixel, with minerals classified at every pixel. Blue Scientific is the official distributor of Bruker Micro-XRF in the UK, Ireland and Nordic region. If you have any questions or if you would like a quote, please get in touch.